GPS Accuracy Estimate (EPE) What is It ? The use of recreational grade GPS (for example Garmin 60csx or Garmin 62S) is now standard practice for the location of forest inventory plots in New Zealand and Australia. We recently reviewed a few questions regarding the accuracy and precision of these GPS units, with many in the industry not understanding the measure of precision displayed to the user. If the GPS displays an Accuracy of 10m, does this mean it is 10m from the actual / absolute location? MOST DEFINITELY NOT !! Firstly it is a measure of precision and in no way indicates accuracy. GPS’s display to the user an estimate of position error (EPE). An EPE is displayed on most recreational GPS devices, although there is no general specification on what this should display between manufacturers or in some cases models from the same supplier, so an EPE from a Garmin device cannot be directly compared to a Trimble or Magellan unit. So don’t be tricked by the marketing material that one unit is more accurate than another just off a comparison of EPE. Also the EPE displayed on any type of GPS is not guaranteed to be the maximum position error. So an EPE is a statistical level of confidence generated for each position. A wide range of factors can influence this including multipath, number of satellites, SNR, PDOP, satellites elevations and period of time GPS unit is switched on prior to recording and how long you stay in one location to record the position (let’s not go into all these today). Although Garmin’s calculation of EPE is propriety, most regard Garmin GPS to use an EPE based of 50% circular error probable (CEP) (*1). This means that 50% of all measurements calculated are within a horizontal radius of 10m. On the other hand, 50 % of all measured positions are outside of this horizontal radius ! So there is an equal probability that the error is greater than 10m. Commonly it seems wise to double the EPE presented on your Garmin device to give you a higher confidence of your position precision (*1,*2, *7). For those interested, 50% CEP can be calculated on the higher grade GPS units from additional information: EPE = HDOP * URA (1-sigma) * 0.73 gives a measure of the 50% confidence circle, i.e., 50% of your position fixes would fall within and 50% would fall outside (*5). Two other common methods are used by GPS makers of higher grade survey units; Horizontal Root-Mean-Square (HRMS): The horizontal distance within which 63% of positions are predicted to fall, Twice distance Root-Mean-Square (2dRMS): The horizontal distance which 98% of positions are predicted to fall. A good way to visualise this is to plot each individual calculated position (in this case I’m using a TerraSync connected to a recreational grade SiRFstarIII GPS in a Trimble Nomad (similar to the Garmin GPS Chip). As shown by the dimension arrow the location moved by some 30m in just 1 minute, yet the EPE shown in the top of the screen is calculated at 14m, and of course the GPS physically did not move and had been operating for more than 10mins at this location prior to recording. TerraSync EPE is based on 63% HRMS precision estimate (*6). 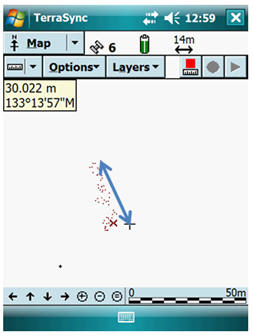 Figure 1: Example of a Recreational Grade GPS plotting last 60 positions calculated (brown dots), showing displacement of some 30m, without physical movement of the GPS unit. So remember your GPS’s EPE readout is just a quantity used to characterize the performance of the GPS, derived from the statistical analysis of the measurements of position being calculated. It is NOT an indication that the given position readout is within “EPE” distance of the absolute/actual position. URA – User Range Accuracy is a quantity that is transmitted in the navigation message that is the predicted (not measured) statistical ranging accuracy. Since it is defined for SPS (Standard Positioning Service), it includes SA. To convert from a statistical measure of left hand side to a different measure on top, multiply by the factor in the intersecting cell.